The following bio brought to you by the tech overlord. Cats. Whiskey. Balboa. In no particular order, these are all things Jen Reed knows well. You know what else she knows well? How to get stuff done. In addition to leading the Hot Rhythm Foundation, she manages staffing for the Austin Swing Syndicate, co-runs the local Balboa and chorus girl teams, and spearheads the New Year's Eve dance. Suffice it to say, she knows what she's doing. This bio brought to you by the tech overlord. Tabitha manages the Foundation's money, which comes with the exciting challenge of keeping Caitlin's hospitality spending in check. She loves dogs and baking. Oddly enough, she's less thrilled by her dogs eating said baking. She co-runs the Austin chorus girl team and, formerly, Collegiate Shag teams in Austin and DC. She loves aerials so much I'd guess that, personally, she prefers the air. Committed to extend a hand to stretch the circle wider, Shannon Butler seeks ways to help strengthen and advance the dance community that has brought her so much joy over the years. Her tools – education, inclusion, patience, and a dash of humor aim to broaden the depth and breadth of the vintage dance community. To honor her commitment, Shannon is an artist in residence through a Minnesota non-profit, which uses dance to teach social and emotional skills to elementary school students. In the evenings, she teaches dance to a variety of audiences: as the founder and host of one of the longest running weekly swing dances in the Twin Cities, through her local school district, and through another non-profit teaching adults with special needs. Since Hot Rhythm Holiday’s creation, Shannon has worn many hats: instructor, speaker, presenter, deejay, vendor and competition coordinator, judge, contestant and assistant tabulator. She is honored to be on the Board of Directors for Hot Rhythm Foundation, and lead organizer for Hot Rhythm Holiday. 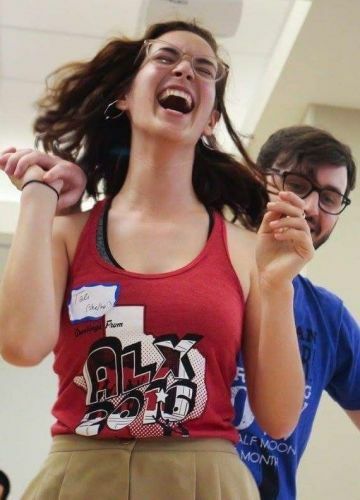 Cailin has been swing dancing in Austin since 2013 and quickly found her way into the collegiate shag community. She has been part of the Rad Youth and Shag Hags shag teams and teaches locally. In real life, she teaches elementary music. She is excited to work with the Hot Rhythm Foundation for a second year! "Ain't no one getting hangry on my watch"
Caitlin joined the Austin swing scene in early 2017, and immediately set herself the task of infiltrating its ranks – with food. It worked, perhaps a little too well, because she found herself in leadership positions on both the Foundation and the Austin Swing Syndicate faster than a quick-quick. She also is responsible for starting twice-monthly shag house parties in Austin, affectionately termed "Shagvilles." Caitlin's endeavors to create a sense of home in the swing scene often manifest as delicious homemade creations, earning her a non-stop stream of gratitude from dancers all over the world. Naturally, she's too modest to say any of this herself, but somebody had to. Tali is so excited for her second year as volunteer coordinator at Hot Rhythm Holiday 2019! She teaches and volunteers for the Austin Swing Syndicate, Texas Swing Dance Society at UT, and at Four on the Floor. Tali is most looking forward to social dancing to the amazing band lineup this year, and hopes to see you there! Zach's first foray into dance volunteering was his college senior spring, in which he lost the secretary election in his college swing club to a freshman. Not to be outdone, he created a new Event Coordinator position so that he could still realize his desire to be useful. It ended up being much more fun than recording meeting notes. Upon returning to Austin, Zach volunteered with the Austin Swing Syndicate and the Austin Lindy Exchange for two years, temporarily taking up the mantle of Instructor Coordinator for the former. In 2016, Zach joined the Hot Rhythm Foundation to assist the previous tech overlord, taking over in 2018. Zach also co-runs Shagville with Caitlin. Fun fact: the maroon/navy blue announcement banner on the front page was inspired by a pair of suspenders Zach picked up in Boston, which sports the same color scheme.